MELNIKOFF Galleries Network. THE CHRONICLES OF HELL. The Official Web Site. Exhibition. "One eighteen-year old girl was killed by two missiles fired by a Russian pilot. This is her story. Three girls went to get some water from the river. On their way back they saw a plane circling in the sky above them. Two of the girls ran away, but the third put down her buckets and called after them saying, "Come back, they won't do us any harm!" The plane made three circles and when the dust settled, the girl could be seen lying on the ground with a bomb crater on her right and on her left. She never recovered consciousness and died in the hospital. 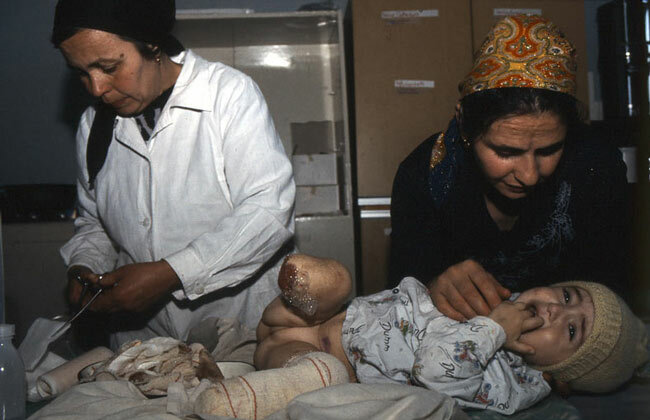 So many women, men and children were left without their legs and arms."